Everyone should know their rights regardless, but it’s even more essential that you do if you intend to go out and film the police. Therefore, you should know if the state you live in has passed “stop and identify” statutes. If that is the case, then you should also know what is and isn’t required under such laws. “Stop and identify” statutes are laws in the United States that allow police to detain persons and request such persons to identify themselves, and arrest them if they do not. Except when driving, the requirement to identify oneself does not require a person who has been detained to provide physical identification. Verbally giving identifying information is sufficient to satisfy that requirement. In the United States, interactions between police and citizens fall into three general categories: consensual (“contact” or “conversation”), detention (often called a Terry stop), or arrest. “Stop and identify” laws pertain to detentions. At any time, police may approach a person and ask questions. However, the person approached is not required to identify himself or answer any other questions, and may leave at any time. A detention requires only that police have reasonable suspicion that a person is involved in criminal activity. However, to make an arrest, an officer must have probable cause to believe that the person has committed a crime. Some states require police to inform the person of the intent to make the arrest and the cause for the arrest. But it is not always obvious when a detention becomes an arrest. After making an arrest, police may search a person, his or her belongings. Five states’ laws (Arizona, Indiana, Louisiana, Nevada, and Ohio) explicitly impose an obligation to provide identifying information. In Colorado, police “may require” identifying information of a person. In some cases it also includes the person’s intended destination, the person’s date of birth (Indiana and Ohio), or written identification if available (Colorado). Arizona’s law, apparently written specifically to codify the holding in Hiibel, requires a person’s “true full name”. Nevada’s law, which requires a person to “identify himself or herself”, apparently requires only that the person state his or her name. 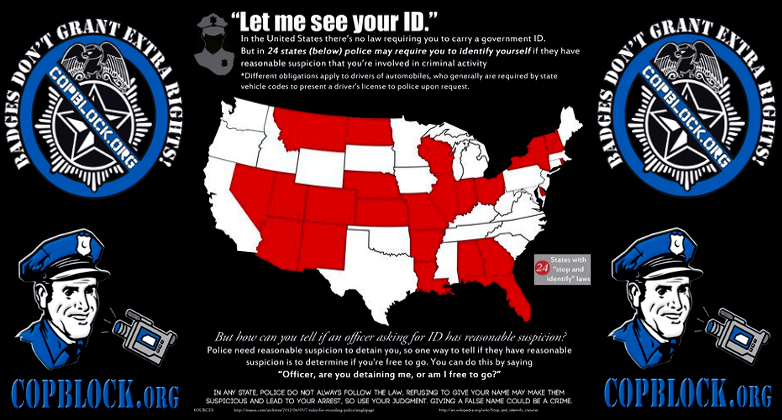 In five states (Arkansas, Florida, Georgia, New Hampshire, and Rhode Island), failure to identify oneself is one factor to be considered in a decision to arrest. In all but Rhode Island, the consideration arises in the context of loitering or prowling. Seven states (Arizona, Florida, Indiana, Louisiana, New Mexico, Ohio, and Vermont) explicitly impose a criminal penalty for noncompliance with the obligation to identify oneself. Virginia makes it a non-jailable misdemeanor to refuse to identify oneself to a conservator of the peace when one is at the scene of a breach of the peace witnessed by that conservator. When Are You Required to Provide ID to the Police?